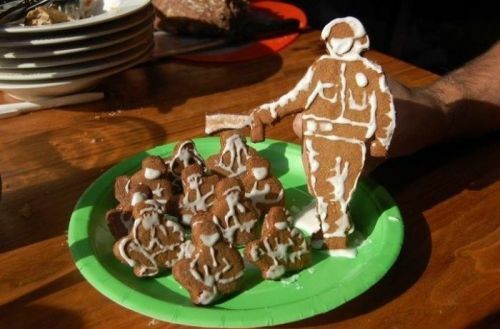 Greetings, Kotaku cadets, and welcome to a mid-week open thread. It's a down week for us, and there hasn't been too much new news. Did you get any good games over the holidays? Did you get anyone else any good games? Are you looking forward to 2012, or dreading it? Can you believe that we Americans are going to have another stupid presidential election already? God, I can't. Here, as usual, are a selection of conversation starters and general random things from around the internet. A new book on Nixon alleges he had a gay affair - Really? I'm doubtful. Scaryground.com has a cool list of the best albums of the year - I should listen to, like, any of these. My new music library is severely lacking. C'mere, Spotify. 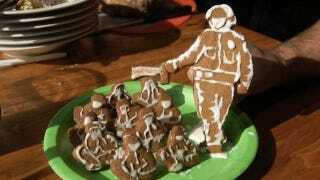 Pepper-spray cop rendered into gingerbread- Truly, the meme that wouldn't die. A hilarious song based on all those "I wanted an iPhone" tweets - I like it when people make songs out of Tweets. The most metal moment of "Metal: A Headbanger's Journey" - HA I cannot even pick my favorite part of this. Thanks, Gus, as usual. An amazing illustrated map of Song of Ice and Fire's Westeros - Holy crap! For an unconventional music pick, here's Steely Dan playing "Janie Runaway." - Sick tune. Some people hate Steely Dan, but not me. That's Chris Potter on the alto sax solo, by the way. And that's what I got! Have great chatting, and a lovely Wednesday evening.